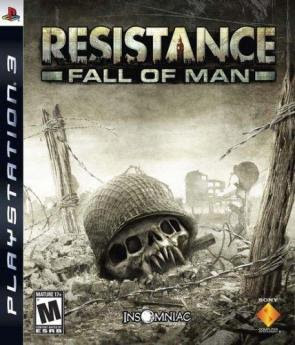 Resistance was one of the early games to be released for the Playstation 3 and an exclusive for the console. 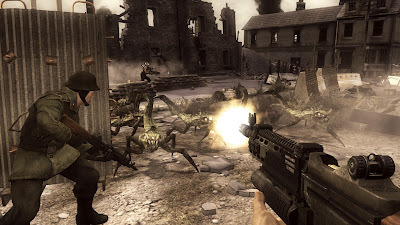 The game is a first person shooter and not a very good one at that. Resistance takes place on an alternate reality Earth. In the early 20th Century a mysterious plague of mutants swept over Russia, this plague then spread to the rest of Europe before finally in the early 1950's it arrived at Britain. Despite defences the Country was soon over run by the mutant horde. 1951 and a squad of American Soldiers arrive in Britain to help the Soldiers fighting there. You take control of Nathan Hale; an American Soldier who upon exposure to the Chimera virus (the mutant army is made up of mutated humans) found he was immune to it. It is up to you to travel around Britain doing various jobs in an effort to free the Country from the alien Chimera threat. Resistance really is not that good a game. 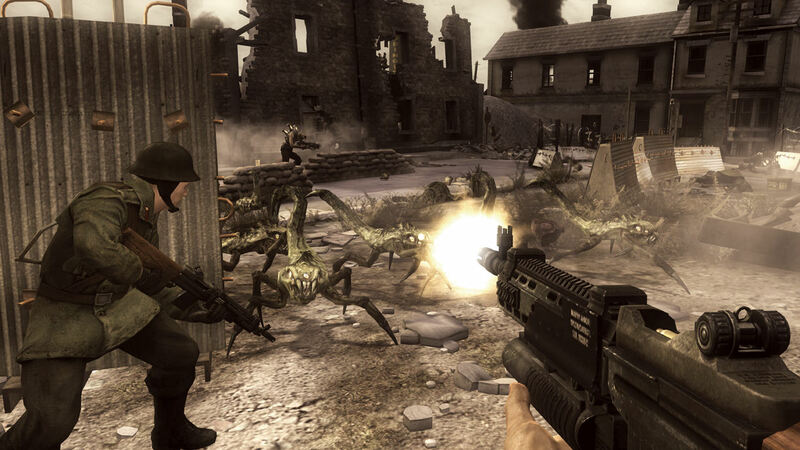 It has chunky plain visuals, terrible A.I, old fashioned FPS traits (such as health packs), boring enemy design and monotonous locations. I guess you could say the average graphics and old fashioned style could be due to its age but that doesn't go in its favour. The game takes place in Britain in various areas, so you have a level set in Nottingham, Bristol, Manchester and even one set in Grimsby. These levels are all pretty much identical with the Towns not looking different from each other. I know there was some 'controversy' with the Manchester level that features a fire fight in Manchester Cathedral but even that location is bland bland bland. If the Cathedral looks like that in real life then I have no wish to visit there. The plot is very stale and is only really there as an excuse for the different locations. Nathan Hale is virtually mute while the voice over between levels is just cringe worthy. 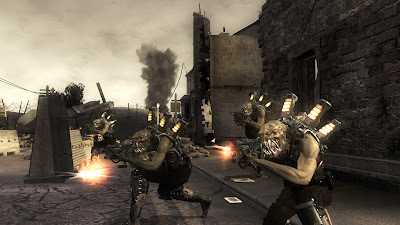 The enemies consist mainly of grunts who are humanoid looking soldiers. Other enemies include fast moving insects, giant robots as well as hulking giants. The enemies are boring and none particularly inspire any feeling other than the need to kill them. Resistance seemed to go on forever, it may be it just seemed that way due to how boring it was. The FPS action is split up with a few vehicle missions that see you driving tanks, enemy robots and a British Jeep (for some reason it is left wheel drive). These sections are also quite boring but are at least easier than the frequently hard FPS sections. The games check point system is ridiculous, check points can be anything up to 10/15 minutes apart, very annoying having to replay large chunks of game over and over again. At around £5 the game is quite cheap now, it just is not great, average at best but frequently falls beneath this. how can you say this? Most things that exist in a certain area tend to be alike. Also if complain about health packs and "old fps strategies" the you cut a significant section out of the fps genre as a whole... the game is fine, the only thing wrong with it the critics who nit pick over every tiny detail and then give it a low score! It's like this: if you go to a pizza place get a pizza that is fantastis with taste and texture but the dough didn't crips the EXACT way you wanted to so you say it is average. I'm not saying graphics aren't an integral part of a game, far from it, I'm saying that you are expecting too much "wow" from a first run title which I can only hope you don't do in the future. Compared to pretty much most FPS games this one is just plain average and boring, and worse; it just is not any fun to play. It is down there with Timeshift and Turning Point: Fall of Liberty. On the plus side the developers really learnt from their mistakes and made Resistance 2 very fun, Resistance 3 looks like it is going to carry on this positive trend.